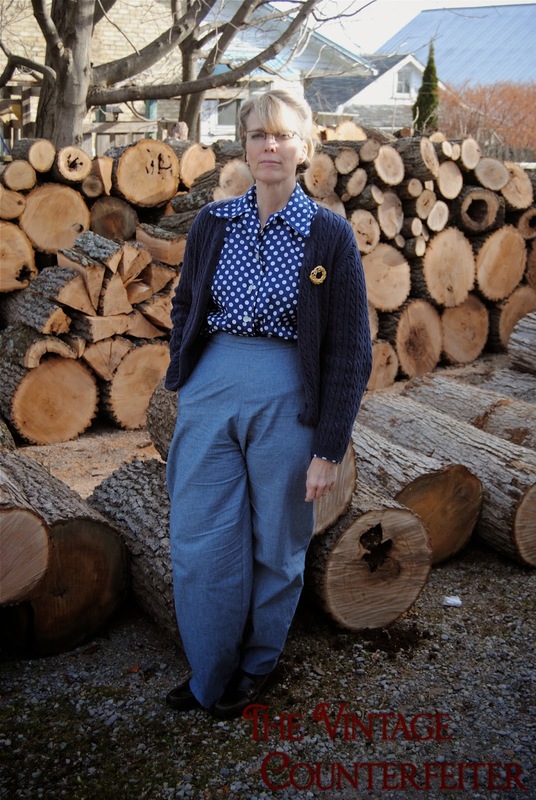 The Vintage Counterfeiter: Hangin' by the Wood Pile 40's Style. My husband has a thing for wood, can you tell? We don't burn wood he just collects it in hopes of putting in a wood stove next year. (which would have been handy since while writing this we had a power outage and things got a bit cool for my liking) I have been checking out wood cookstoves. I think it would be interesting to learn to cook and bake with wood plus I think the wood makes kind of a neat background for pictures. So these are my 1940's trousers made from this pattern and fabric picked up from a thrift store. As you can see the pleats are missing. I took them out. To me they weren't flattering on me in the 80's and that hasn't changed now. 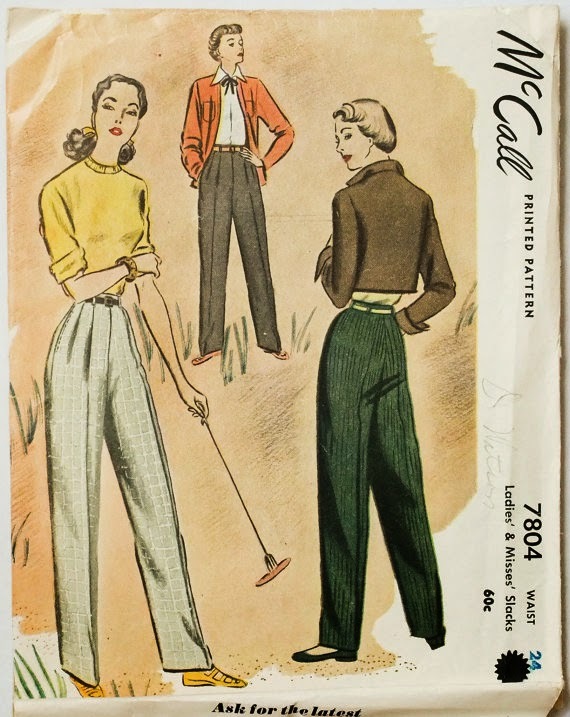 If I had lived in the 40's I can't see me liking them much then either but I suppose the design was to mimic the men's trouser since women wearing pants was still a fairly new thing. You may be wondering why oh why I'd want to make a pair of 1940's pants but as I continue my journey of only wearing clothes I've made or thrifted a whole new world has opened back up for me. 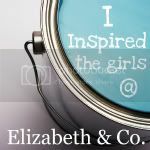 I've always adored the simplicity of 40's clothing and the 50's with it's petticoats and hat wearing styles. If you've known me for a really long time you'd know that wearing these eras is not really new for me. I've played with these styles since highschool. Yes thats me at prom with sweetheart and husband to be. My ensemble was not the same as every long gowned girl but more reminiscent of a 40's knee length style complete with hat and black lace gloves. I find today's clothes fairly generic and that's why I've found making my own clothes has begun to suit what I've been missing for so long... a reflection of me. It's not that I'm trying to stand out in the crowd by wearing vintage clothing but because I'm beginning to feel more at home in my clothes again. 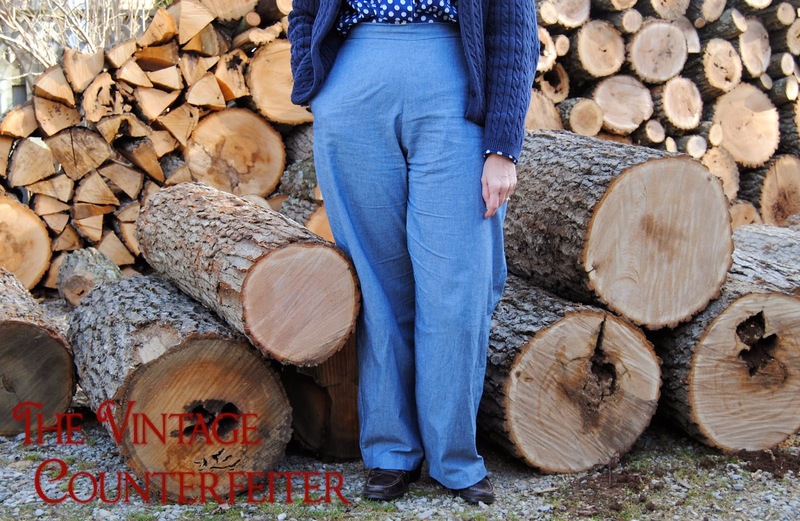 These pants not only cover what today's jeans don't on my backside when bending over, ( think the old plumber's cliche and you get the picture) but they allow me to wear my beloved long johns underneath! I made the blouse from another 1940's pattern and the sweater came from a thrift store as did the shoes. I can tell you this is not my everyday wardrobe but its more of my going out to dinner or Sunday go to church look. Right now if I took a picture of myself you'd see a yoga pant, sweatshirt clad girl and I intend to sew myself some new everyday clothes and share those with you too. you look so pretty in those blues! Agreed to no end. Sure, there is a degree of originality and trends keep things somewhat fresh, but by and large I find 21st century clothing to be very generic as well (ditto for hairstyles). Granted each era has had certain key styles that helped to define it and which perhaps a small percentage of people back then found generic, too, but we know now that they (the styles) were anything but compared to what would follow in more recent decades. Very few modern styles of my youth spoke to me, whereas vintages not only spoke, they sang like a celestrial chorus of angels, beckoning me to day long gone, yet still close enough in the history or our world to easily find their offerings. As such, it was just natural that I would transition into old school styles and more than half my life later, I'm still doing so and love that dressing the way we (vintage folks) do brings me such pleasure (while also ensuring my outfits never veer into modern cookie cutter territory). Wonderful monochromatic ensemble, dear Debra. Blue really looks fantastic on you!